1.5.0 Beta 2 is released! Please make sure to also read the announcement for the Beta 1, especially the warning about the nature and potential shortcomings of beta versions. As always, Beta 2 can be downloaded here. Many thanks to all of you who participated in the Beta program so far! By the way, the beauty in the header of this note is designed in Wing Helper by Manni, one of the most active members of the Beta test team, and a Wing Helper wizard. He is much better in using Wing Helper to its’ maximal abilities than I am. Wing Helper 1.5.0 "In Final"
We are happy to announce the first public beta version of the upcoming Wing Helper 1.5.0! Our Alpha Test Team already did a great job in making sure that this version is working correctly. In this beta test phase, we are looking forward to finding - with your help - and fixing the last remaining bugs and issues before the final 1.5.0 is released. You can find the official announcement, with screenshots and download links, directly on the Wing Helper web page. HOT: NC export (G-Code for 4-axis CNC foam cutters) - GFK and CFK wings, we are coming! 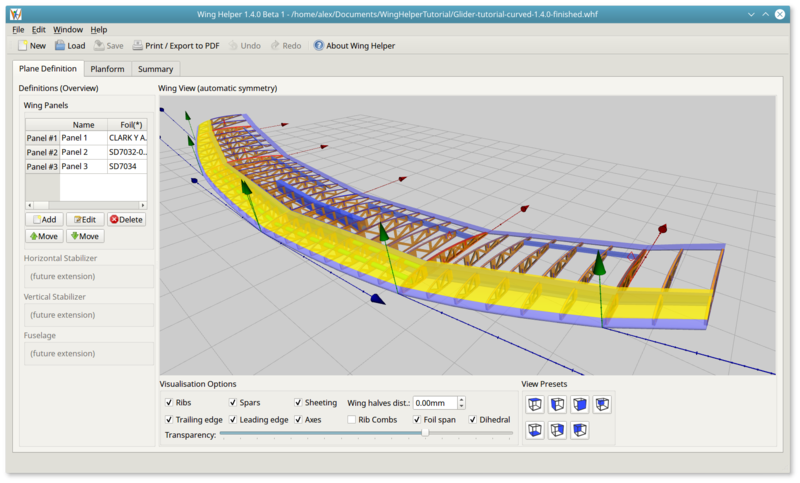 New type of trailing edge: "Standard (Height)"
Wing Helper 1.4.0 "In Final"
We are happy to announce that Wing Helper 1.4.0 is nearing its' completion! The public beta-test phase has been going on for a few weeks already, in case you missed it, you can find all the relevant information on the Wing Helper web page. 1.4.0 Beta can read the files created with previous official versions. Due to a change in the file format, the older versions of Wing Helper will not be able to read files saved with 1.4.0 Beta (or newer)! For that reason, we strongly suggest that you always store away your existing designs before working on them with a newer version. By doing so, you keep the option to step back to the previous Wing Helper version if you wish to or if a need arises. 1.4.0 introduces a great variety of exciting new features. In order to enable this, we had to re-work many program internals, changing quite a few of existing methods and algorithms. For that reason, please make sure to double-check your existing designs after moving to Wing Helper 1.4.0 Beta (or newer) - it could be, that some settings will need a bit of fine-tuning. Wing Helper version 1.3.0 is officially released! New file format (V2). This means, 1.3.0 can read old files, but if you save something with 1.3.0, you won't be able to read it with earlier versions! We are happy to announce that the Wing Helper 1.2.1 is officially released! 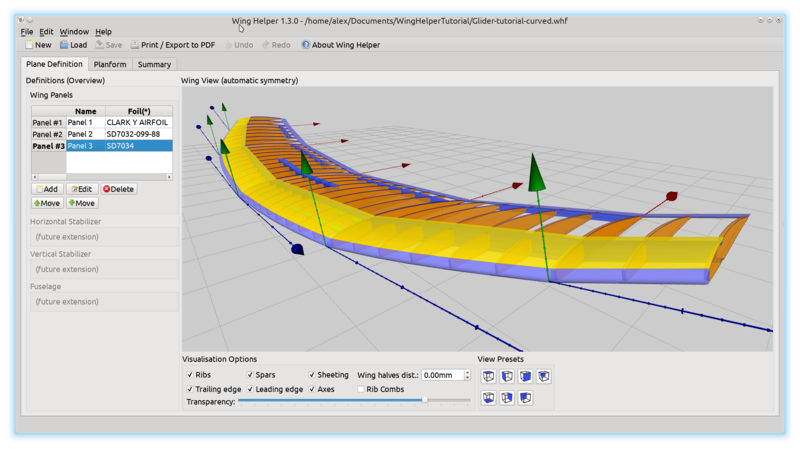 As originally described in this article, Wing Helper is a state of the art parametric 3D CAD program for design of RC airplanes. In the current version, Wing Helper focuses on the definition of the main wing. In future releases, we will be adding support for empennage, fuselage, electronics, and more. Wing Helper is distributed on a "try-before-you-buy" principle. You can download it for free from our web page, install it on your computer (Windows, Mac or Linux), and evaluate it for one whole week without any functional restrictions. A virus scanner report can be found here. If you already have a Wing Helper license, this license will be valid for 1.2.1 as well. If you don't own a Wing Helper license yet, you will still be able to use the Wing Helper, however the DXF and PDF export will be disabled after the expiration of the test period, which is one week past the first installation of Wing Helper. Last night, after 2 years of development, and a 3 months beta test phase with 18 participants from all over the world, Wing Helper 1.0 saw the light of day. Wing Helper is a state of the art parametric 3D CAD program for design of RC airplanes. In the version 1.0, Wing Helper focuses on the definition of the main wing. In future releases, we will be adding support for empennage, fuselage, electronics, and so on. Traditional parametric CAD programs force the user to enter huge amounts of data without much (if any) visual control. On the other hand, CAD programs such as AutoCAD or Blender are based on a pure graphical manipulation of data. This approach allows a huge degree of freedom (you can draw anything, from the screw to the space ship), but it also imposes a very steep learning curve on the user. 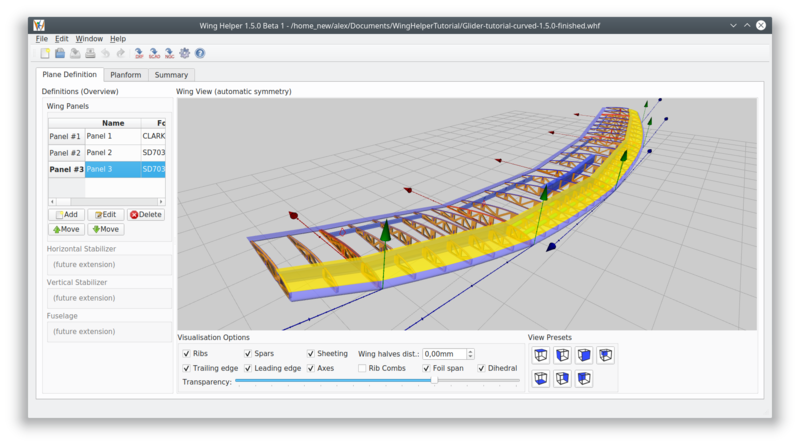 Wing Helper allows you to define your construction by specifying the numerical data (parametric approach), while at the same time representing the effects of your changes visually in a "live view" window. Wing Helper is not a general purpose CAD program, it concentrates on a single task, and makes this task as simple as possible. By following this philosophy, Wing Helper combines the best of both parametric and visual worlds. Wing Helper is distributed as a shareware, on a "try-before-you-buy" principle. You can download it from our web page, install it on your computer (Windows, Mac or Linux), and evaluate it for one whole week without any functional restrictions. We invite you to visit our web site http://www.winghelper.com/ for a detailed description, including a feature list, user manual, training videos and a forum. We are looking forward to hearing from you! Finally, I managed to find some time and to continue to work on my SBach 342. In the meantime, I purchased a copy of DevWing - a very very nice program, although a bit unstable and "quirky" at moments. I'll be posting my wing definitions here as soon as they are finished - for the time being, I concentrate on the fuselage. What I am pretty unsure about is whether I picked the wood (ply vs. balsa) and thickness correctly. The most will be balsa, at least that's the current plan, and it will be a 2mm balsa of a harder kind. 3 resp. 2mm ply will only be used for the motor mount, firewall and the front part of the fuselage. The turtledeck and the upper area of the fuselage front partition (say, "fore turtledeck" ) will be sheeted with 1 or 1.5mm balsa (please note, that the formers are not yet adjusted for the sheeting thickness! ), and the entire fuselage will then be covered with covering film. I hope to make a depron prototype tomorrow, just the "base" without any sheeting, to see whether all the parts fit correctly. I only have the 3mm depron, but it will be a good approximation for the 2mm parts I guess. If somebody wants the CAD drawing, I'll be happy to provide it. A "letter / A4 paginated" PDF will be provided with the final plans. All parts, except for the obvious ones. Blender 3D definition. All modifiers *should* already be applied here. after a break, I'm back at building. And this time, I'm trying to produce my own plans! I picked the gorgeous SBach-342. The model will be built from balsa, covered with film. Wing span will be approximately 1m. If you are interested in details, you might want to check this thread: https://www.rcgroups.com/forums/show....php?t=2159333 for further details. Finally, I had my first few flights today. The weather gods were nice to me - almost no wind, and here and there even a weak thermal. After the fifth flight, I had to pack up and go home because the motor started to sound "strangely" (maybe I should stop buying 7$ motors and hop up a class to 10-12$ a piece ). Guppy flies really nicely! I was pretty much afraid of flying without ailerons (my first plane was a Floater Jet, and she did have ailerons), but it turned out it's quite easy. No wonder RETs are recommended for beginners. Didn't have to do much trimming either, she just flew as I built her. Of all my planes, Guppy flies the most beautiful circles, almost without losing any height while doing so, stays in the air even when there's just the slightest of all thermals and all in all behaves just perfectly. I can't wait to try her out on a slope! For strong winds, she's surely too fragile, but when the conditions are "right", she might be the only plane in the air, while all those GFK ships are laying around in the grass and waiting for the wind to pick up. I had 5 flights today, the on-board video is from the second flight. I had the feeling that the camera (808 #11) has reduced the gliding time quite a lot, without a camera, the plane just stayed up, with the camera, I had to use much more motor. On the other hand, maybe I was just lucky on my other flights to find some (weak) thermals, who knows. Ultralajt, THANK YOU VERY MUCH for this gorgeous plane! 1. Made the fuse 6mm wider. No idea how you people manage to cram all the electronics into the original fuse! 2. Didn't make the fuse quite as nice and smooth as the original plans call for, out of the fear that covering it would be much harder. Turned out the fear was exaggerated, I think the next time, I'd make it nice and round, as shown on the plans. The plane is wonderful, and I'm pretty happy with the result. I'm afraid it will take some time until the first test-flight: right now, the weather is not suitable and the next week-end, I'm on a trip, but I hope I'll manage to make at least a few trimming tosses. The AUW is shy over 500g, with the 3s 1000mAh LIPO and a EMAX CF2822 motor with a 8x4.5 folding prop, which seems to be a bit of an over-kill. Maybe a 2s would also be suitable, I'll have to test it. The covering film is from HobbyKing, turned out to be just GREAT, at a laughable fraction of the price some other, well-known films. As I said, my first covering job, and I had no problems at all. Finally, a ground-based video of my OSG! The conditions were pretty bad (for soaring), but it was the first flight of the season, so I was enjoying it anyway. It's been 3 months and 1 week since my "looking for slope glider plans" post. Today, finally, my "Pimped OSG" is Almost Ready To Fly! Tomorrow the weather could just be good enough for a few tosses... fingers crossed that all the hard work actually pays out! I was aiming at a slope glider somewhere between 1000 and 1500g of weight. As I put it on the scale today, I was surprised to see AUW 920g! Wow! For a 1.8m wing span, depron / balsa / plywood combination all covered in GFK, I was pretty happy with the result. Unfortunately, the plane is SO tail heavy, that I had to stuck 140g of ballast into the nose to get the CG right. That brought me to 1060g - still nice, but I'm kind of disappointed I have to carry dead weight around. Anyway, I'm proud of the result, over 1kg or not. Fuse. The two orange tubes are antennas. I got some fancy-pants push rods with a snap-on mechanism. DIdn't like it, cut it of and went for a trusty old connectors. Silicon hinge. They are just GREAT! The horiz stab hinge turned out a bit too thick, so I put cuts to it (5-6mm at a time) until it felt right. M6 nylon screw to hold the trailing edge of the wing. Ok, here we go again... Wing #3! But this one is going to FLY! One way or another. As it turned out, carbon spar, as I put it, is not an ideal way to enforce the wing. I was also way to sloppy while cutting, the blocks I cut the cores from were useless as a help for balsa sheeting. Besides, I forgot to cut in a washout. Silly me, I *knew* it existed, but didn't think of it until Don asked me. So - in the dumpster it goes. Well, not in the dumpster yet, have to salvage those carbon rods first. Armed with the wire-cutting knowledge of the previous wings and this time taking VERY much time to get it as well as I possibly could, this is the result. The cores still look rather bad near the TE, but I don't think one can actually do this job much better without better tools. Once covered with 1mm balsa, the TE ugliness disappears anyway. The wing I was aiming at was S6063 (7%). What I ended with, and I *really* tried hard, is something resembling S6063, but not the S6063 itself, due to building inadequacies. GIven the similarity of profiles out there, I'm sure my wing now is a kind of a Frankenstein's Monster, flicked together from different profiles, scattered randomly all over the place. I ditched the previous wing (it took me some tears to rip that spar out of the EPS) and made a new one, this time painfully taking care that the wire of my hot-wire cutter is as straight as possible. I'm very happy with the result - good that I got rid of the old wing! In the mean time, the laminating epoxy is ordered (Hobby King sells stuff from BSI, it should be very good), 48g GFK too, now I can only wait. There is enough to do anyway, I won't be bored. I also ordered the servos from Giant Cod (now Giant Shark): Tower Pro MG90, cheap ones getting pretty good reviews, they should be here until the end of the week. Wing in all its' glory! The outer panels are still not glued to the main (middle) panel. Test-run with balsa. Shortened the burned parts of the EPS, replaced them with 3mm depron, and sanded Depron down as far as I could. At the thinnest position, the balsa shimmers through. This is NOT the TE of a S6063, but I hope it won't make much difference. This plane was designed to be a gentle soarer with motor to help her gain height, and as a such she performs beautifully! However, the requirements on a sloper are a bit different. What I learned from talking to Springer, davereap and Don Stackhouse from DJAerotech (check http://www.djaerotech.com/, there is a GREAT information section in "Ask J & D", these guys build beautiful planes), there are a few important design considerations to follow when building for a slope. THANK YOU VERY MUCH guys, I learned (and am still learning) a lot from you! - Hang gliding in stronger winds impose rather high loads on the structure. Build the plane accordingly. - Landing without a motor also sometimes turns out to be a pretty hard one. Make sure the fuse will survive it. 2. Visibility. On the slope, you can get pretty far in search for thermals. Interestingly, it's mainly the chord length and not that much the wing span which aids the visibility of a plane! Finally, my Pitts is Ready-To-Fly! I rushed the final few steps a bit, I admit, but I'm very happy with the build. She came out just shy of 700g (24.7 oz) AUW, with a 1300 3s LIPO - a real fatso compared to the 18-19oz advertised by Tony! Don't know how that happened, but I hope the good side of it will be that it will handle the wind better. Always look on the bright side of the life! Power (with the above setup): a bit over 20A / 250W - resulting in 166W per lb, which should be more than enough. She surely wanted to fly out of the hand during the static test, I had to hold her very firmly. I had some troubles trimming the connector wires between the lower and the upper wing to the correct size. At the end, I resorted to a Z-bend, which made the things not exactly simple, but at least possible. Looking forward to a maiden flight next weekend! After a short break (and a middle depression due to the premature death of my BluBaby 42" - may she rest in pieces until I find some time to repair her), I managed to continue with my Pitts. I must say, I like that kfm2 airfoil really much! The LE looks just beautifull, it's easy to build, and many people say it flies very nice. But enough words - see for yourself! It's still (for a large part) a dry-fit, I need the paint job done before all the glueing begins. Oh, yes, and the electronics, of course. But it already looks like a plane! And a beautiful one! The farther I come, the more I love this plane! Great design, not too hard to build (even for a beginner builder like I am), and it already looks as if wanted to take off and roar the skies. Here the most recent photos. As it seems, if one builds exactly according to the plans, the rear section doesn't quite work. I looked for how other people solved the problem - I found a few pictures showing that others had the same issue, but didn't find any photos detailed enough to help me out. As you can see, I moved the fin a bit towards the nose. That way I only had to cut into the rudder, as shown on the plans. I also had to cut some foam out from tail section to accomodate for the fin, which now reaches "into" the fuse. I started out with the Monobloc. This time I opted not to go EPS, but to try out that blue foam: Roofmate. Don't know whether it's the same one other US-based guys are using for e.g. BluBaby, but I think it's at least pretty close. Here the first pictures, more to follow! Templates for my hand-held hot-wire foam cutter. Made out of 2.5mm balsa, and carefully sanded down to be as close to each other as possible. My 5cm Blue Foam sheet was somewhat too short, so I had to cut out a part and extend it a bit. It seems UHU Por holds like hell on this material! Another view of the monobloc. Finally, the second part of my blog. Except for, maybe, covering the wings with packing tape and for placing a few decals, the Baby is finished. And she looks GREAT! Of course, there are some points that I would do differently now, but that's what it's all about: learning. Watch out while painting your plane. As you can see, I managed to do my paint job less than perfect, although I took quite some time to mask the wing. See point one. Always use your glue as it was designed to! I had to throw away my first fuse (presented in the first part of this blog) and to completely redo it because I applied UHU Por badly. I just poured it generously over the EPS and connected the parts before waiting for the glue to dry up a bit. The result: at first, the connection seemed OK, but than the glue ate its' way through the EPS and the bond was destroyed! Watch out for your cats (if you have any) not to develop too much of an interest in your plane. Luckily, I cought my cats chowing on the scrap EPS parts laying around, but it also could have been the wing! Clark Y wing inclination recommendation: 3 deg positive. The re-enforcement / push rod holder finished. If you look closely, you'll see the openings where the push rods will go. Also laminated, to make it more resistant. Motor mount - another view. Glued with CA, then with hot glue. Attached to EPS with UHU Por and additionally secured with carbon rods. The pushrod holding block you saw above, also acting as a holder for the RX. Servos located between this block and the monoblock. ESC in the lower compartement, for better cooling. The lipo in the final configuration sticks all the way in, to achieve the correct CG. A view into the fuse. The top cover is placed on two sideways depron strips (you can see them above the wing holder) and only attached by packing tape. I guess having that part removeable will help eventual repairs in this area.